Improving on a masterpiece: An opportunity you would not let slip through your fingers! 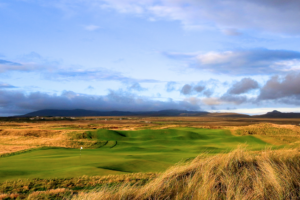 Scott MacCallum took the chance to visit the Machrie, a golf course very close to his home and his heart but which is not quite so easy for others to reach. He also manages to complete an entire article about Islay without once mentioning its most famous product – whisky. Making changes to anything already regarding as excellent can be extremely risky and is often compared to adding a touch up to the Mona Lisa – best intentions may abound, but it rarely has the desired effect. 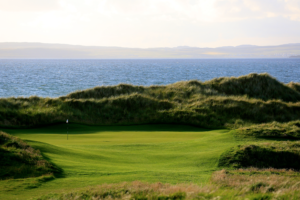 Now the Machrie golf course, on the beautiful Inner Hebridean island of Islay, wouldn’t be so presumptuous as to compare itself to that famous work by Leonardo da Vinci – leave that to the likes of the Old Course and Augusta National. 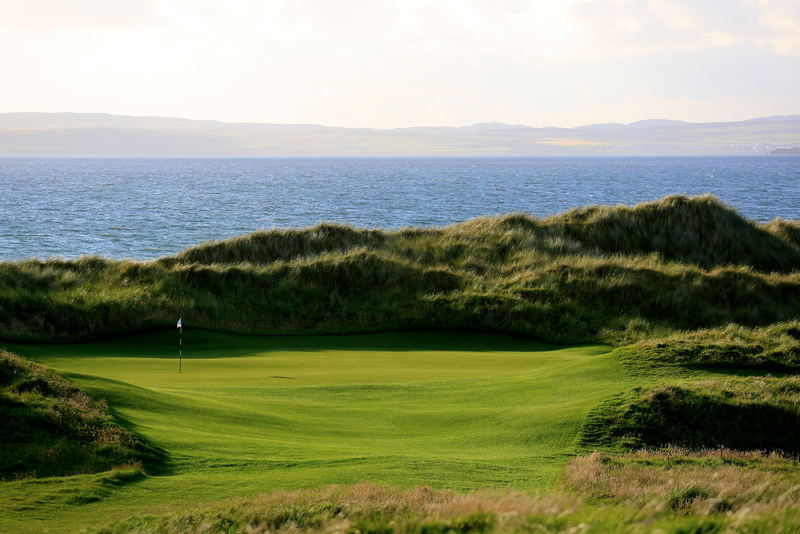 However, it is still very near the top of the tree when it comes to outstanding British golf courses. So maybe the work that has been carried out over the last three years could better be compared to polishing the antlers on Edwin Landseer’s famous work, The Monarch of the Glen, particularly appropriate as deer do roam wild on the island. However, on this occasion, art or golf course critics would be hard pushed not to recognise that the original has been improved upon. The proud stag looking that little bit more majestic and those 18 holes, woven between the dunes at the Machrie, even more enjoyable to play. The results of the golf course work, and the near completion of a stunning new hotel, are all the more remarkable given that just a few years ago it looked as though the Machrie, hotel, golf course and all would fade away leaving nothing but memories – not least the famous match in 1901 played out between golf’s great triumvirate, James Braid, JH Taylor and Harry Vardon, for £100, which was reputed to be the largest prize ever played for on the British Isles at the time. In administration, hotel abandoned and golf course looking a little lost, it was bought by Gavyn Davies and his wife, Baroness Sue Nye, who fell in love with the place – at first sight – in 2011. Since then that work on the Monarch of the Glen has been on-going and has probably even exceeded what Gavyn and Sue envisaged as they began the project. Renowned golf course architect DJ Russell, himself a former Tour pro; golf course constructor Edinburgh Landscapes have seen short term contracts become long term as the work developed. Also brought on board was Course Manager, Dean Muir, head hunted from Muirfield where he had been Deputy Head Greenkeeper, and Dean has been heavily involved in all the course work since his arrival three and a half years ago, not least in ensuring visitors and members of Islay Golf Club had opportunities to play while work was going on all around. “DJ asked if we could have a chat about the prospect of coming over here and it sounded interesting,” recalled Dean. “It was a good few months since previous Course Manager Simon Freeman had left and it had become very run down – the 9th green had thistles growing in it feet high. I came over again later and Gavyn and Sue flew up that day to meet me which was very flattering. I kept waiting for someone to jump out and say it was a big wind up,” said Dean, who was full of praise for the job that Simon and his team had done with limited budget. But it was never going to be an opportunity he was likely to let slip through his fingers. That said it has not been plain sailing and has involved Dean embarking on a pretty steep learning curve, not least because of the move from the east of Scotland to 30 miles off the west coast of Scotland. From an agronomic perspective it has seen Dean making changes to his thinking and making grass choices which he wouldn’t have made had the Machrie regular rain patterns. He sees full establishment taking up to six years with the newly shaped sand based contours not retaining the nutrients to speed root development particularly with the rain flushing through anything which has been introduced to strengthen and speed up development. Island life is suiting both Dean and his wife but being surrounded by sea has meant his planning has had to go up a notch. Dean has employed a mechanic to ensure breakdowns don’t mean the visit from a mainland based dealer and wherever possible they aim to be self sufficient. While Dean was getting to grips with the agronomics he has also worked closely DJ Russell and Eric Samuels, of Edinburgh Landscapes, on the changes to the course and other additions including the fabulous six hole par-3 course which will be a huge attraction to those new to the game and a nice distraction for corporate groups pre or post dinner. Together with the new Golf Academy which features both covered and open bays it will offer practice facilities that would shame many other clubs or resorts. 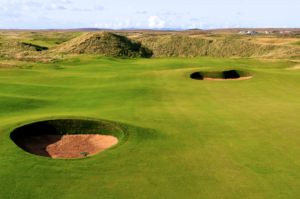 The redesign has seen the removal of many of the blind shots which were a feature of many older golf courses and it now flows through the dunes opening up the holes and the wonderful views which the course boasts. Never overly peppered with bunkers the original new design had none but currently five have been added, two to frame the par-3 3rd green and two in the 6th fairway to concentrate the mind on the tee shot. The other one is at the back of the 7th. With the new 47 room hotel due to open in May or June the “building site” first impressions of the Machrie will disappear and it will become the high quality Campbell Gray Hotels run hotel Gavyn and Sue had always dreamt it would be. 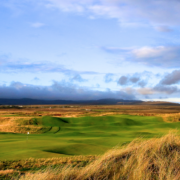 Without actively marketing the golf course it has already crept up several spots in some of the course rankings and the completed Machrie will no doubt see another boost. “We have been keeping it under the radar as we’re not finished yet and first impressions currently are not great. Another group of Australians had been enjoying the golfing trip of a lifetime playing every top course in Scotland when they arrived on Islay. It is magnificent company to be keeping and with Islay, and the Machrie, either a flight or a ferry ride away, the inaccessibility will add to the attraction for many. Wind, rain and, in the summer, midgies apart, Islay is a trip not to be missed if only to see that Monarch of the Glen looking better than ever. Eric Samuel, of Edinburgh Landscapes, arrived on Islay for what he thought was going to be a 16 week project – a few tweaks to and amendments to the course. Three years on he is virtually an honorary islander! “The project just grew and grew and we were delighted to be a part of it,” said Eric. Edinburgh Landscapes have worked on some extremely prestigious jobs including Renaissance, Archerfield and the changes to the PGA course at Gleneagles in advance of the Ryder Cup but according to Eric the Machrie doesn’t lose out by comparison to any of the others. Many of the contours are natural but there are others which have been man made by Eric’s son Robert, who was the shaper and who has now moved on to work with top American golf course architect, Kyle Phillips. Eric was heavily involved in the development of the six hole par-3 course. “DJ wanted six holes where every hole could be played from every tee. Sounds great but not easy as you have to have every green able to accept a golf ball from all angles. As it is you can do it from every hole bar one but it has been designed for juniors to play driver and run the ball up or people to practice their short games. Basically it was the old 18th hole. We marked it off and pushed some dirt about,” said Eric with typical Scottish understatement. For DJ Russell, pictured, a long established and respected Tour golfer, now resident at the prestigious Archerfield Club, near Edinburgh, becoming involved with the Machrie was a case of fate. “It was a case of owners in it for exactly the right reasons and a group of people coming together to achieve something special,” explained DJ. DJ arrived initially to look to tweak a few things, change some of the poor holes and replace them with much better but it was a delay in the sourcing of a water supply which created the opportunity to do something on a much grander scale. “We thought we’d get the water issue resolved quickly and get on with building the hotel but in fact it took three and a half years to get permission for mains water to the site. That gave me two and a half years to wander around the site and see what would make a really nice hole and then work out how I could link together 18 extremely good holes. There is no point if having a couple of spectacular holes and linking them with holes that are not so good. 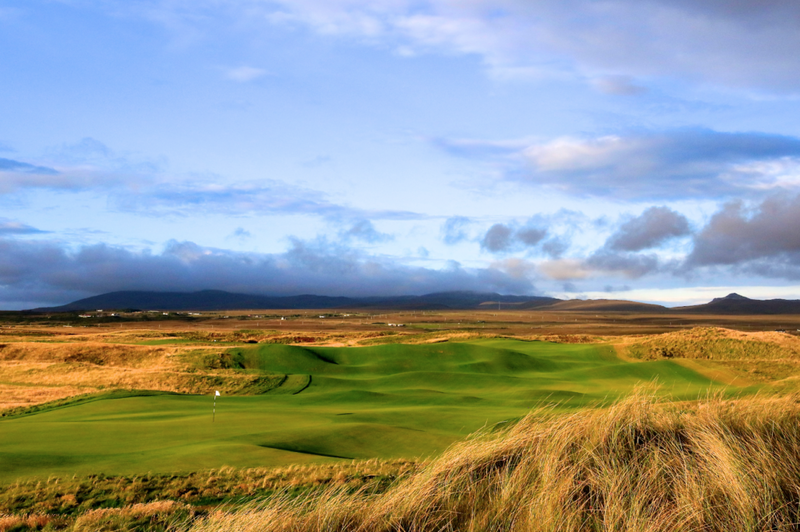 “It was then a question of getting the owners to buy into the concept and then, just as importantly, getting Islay Golf Club’s backing,” said DJ who added that it was the hope that the golf club would always be the beating heart of the Machrie. That achieved the new course would remove many of the existing blind holes and shots and replace them with a well worked route weaving its way around the wonderful dunes. “If you got hit by a featherie it wouldn’t hurt too much. Get hit by a Pro V1 on the back of the head and you know about it,” was DJ’s explanation for the need for fewer of the blind shots for which traditional links golf was so well known. As to the lack of bunkers DJ’s philosophy is to make the course playable to all. “There were a few bunkers on the original course but they can be a problem on links courses. For example there was one on the 14th but it meant that, downwind, unless you were an extremely good player you couldn’t land the ball over the bunker and keep it on the green. He sees the wonderful six hole par-3 course as key to the ambition to make golf so much more accessible to the youngsters of the island. Speaking with DJ his pride and passion for the Machrie just pours out of him.